Over the last few months I have been gardening blind, for the most part anyway. My new clients’ gardens were previously unknown to me and as such a mystery. Strangers who I needed to become acquainted with and hopefully will eventually call my friends. In an attempt not to appear a complete dimwit (quiet please in the cheap seats!) I have desperately been studying twigs and bark and interrogating owners for clues as to what various trees and shrubs might be. Many of the herbaceous perennials have also been dormant, nestling underground until warmer conditions tempt them out, and I have been stumbling across them in borders along the way, trying to distinguish the wheat from the chaff. Now as spring progresses every visit divulges a little more of each garden’s secrets and in turn inspires even more expectations. The turn of the season is slowly revealing what lies beneath and within. I had correctly identified this as a magnolia tree (such brilliance) but today, when I saw a tantalising glimpse of dark dark flower beneath the split casing, the anticipation of this tree in full bloom is almost unbearable. 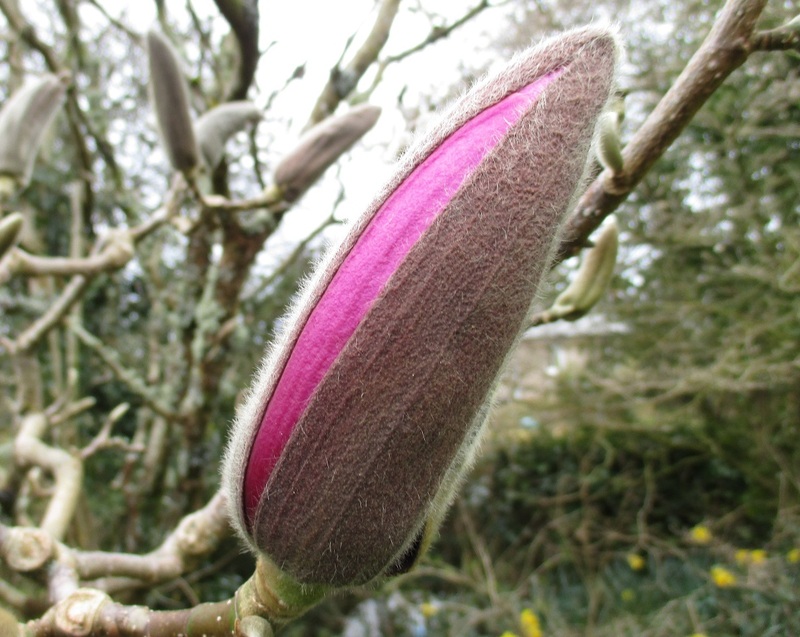 That first glimpse of colour in the the opening bud is exciting, isn’t it? I think I understand what you mean about getting to know a new garden, as I have been doing that for the past year and a half with my own garden. Fortunately, we moved in July, making it easier to identify plants, but there were quite a few shrubs I didn’t recognize. As I found names for them, I made notes, but then promptly misplaced the notes. I really do have to find a better system! Your confidence in my memory may be unfounded. Yes, it’s definitely spring here–what a joy! Who cares what they’re called? Quite true, you can give them your own names if necessary, that is what I plan to do! They are such amazing trees, so varied as well. Then we forget them until next spring! Fickle folk (well I seem to be anyway).